When I originally started eating beans on a regular basis, I was pretty much sticking to the theme of Mexican style. With this elimination of processed oil business taking place in my diet, I’ve had to reevaluate some foods and meal planning in order to keep my pallet satisfied, yet curious. Leaving olive oil and raw butter out of my diet definitely changes the rainbow of flavor! However, it’s only creating more room for creativity in my kitchen lab! I’ve always loved Indian food, but never really took the time to make my own. So, I gave this bad boy a shot, and turned out with a great success! So far, everyone that I’ve given a taster to loves it! I love making this dish because its simple to make, delicious to eat, loaded with nutrition, and an easy option to take to work the next day. I hope you enjoy this fantastic Indian inspired plant based complete protein option! Soak all beans in purified or spring water for at least 2 hours. Beans should look swollen with water. The casing of the beans may loosen during soaking. If there are too many, you may discard them. Drain and rinse the beans after they’re done soaking. Bring pot of water to a boil before pouring the beans in to cook. Once beans are in the pot, let them simmer with the lid on until the bean is completely soft. This can take anywhere from 2-3 hours. Using a crock pot on lower heat is another way to prepare the beans overnight. After an hour of simmering, add in all of the powdered spices. Adding the spices in when the bean has had time to soften allows them to infuse throughout the bean during its cooking duration. The only powdered spice to add lastly is the Turmeric. Do not add until the stove is ready to be turned off. With the heat turned off, add Turmeric and lime. Only add salt to your beans in the bowl you’ll be eating out of. Once beans are fully cooked and soft in texture, they’re ready to eat! Depending on the consistency you’re in the mood for, there are multiple ways to eat these delicious beans! If you prefer to have a bean soup, an additional ½ – full cup of water to your bean portion. For creamy beans, then no added water is necessary. 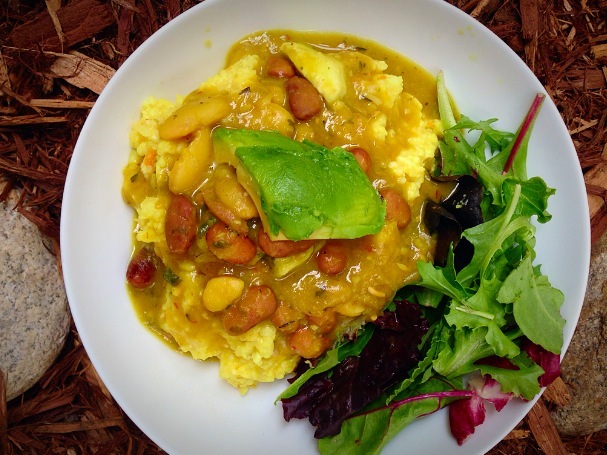 Pairing beans with rice make a fantastic complete protein that is entirely plant based! Enjoy anytime, any day, any season! So grateful to know YOUUUU miss LeAnnnnnn! Keep the passion we share!